It’s time to say goodbye to Cricket as we welcome Hockey, Rugby, Football and Basketball back into our diaries. However, before we let it go completely, we thought we’d take a look back at our local clubs stellar performances this season from the Kent Cricket Premier League all the way down to Division 7 of the Kent County Village League. After last year’s fierce relegation tussle, Sevenoaks Vine never looked like repeating themselves and secured top flight status for yet another year with plenty of games to go. In fact, they were so good this season that they very nearly could have won the league, had a couple of results gone their way. The season started and ended with wins on the Vine, however for every couple of matches won mid-season, there were losses as well, including two of the last three matches. The 2nd XI traded blows with local rivals Holmesdale and Hartley Country Club and although they gave a good account of themselves the season was just not long enough for them to challenge for the title. Holmesdale have been relatively quiet by all accounts this season. After relegation from the Premier League last term, it was hoped that they would bounce straight back. And they certainly got off on the right foot after winning seven of their first 10 matches, with one being abandoned due to rain. However, when July hit, their batsman didn’t, as they went on a four match losing streak to put an end to any chance of promotion back to the top flight. For the 2nd XI, they didn’t even secure their first win of the campaign until mid-June, but this was to be a turning point in their season as they won willingly home and away only to lose a few more times. In the Kent County Village League, Farningham were plying their trade in Division Three against a number of local rivals including Stonewall Park, Weald Underriver, with the latter two being relegated to Division Four after shocking season. Farningham on the other hand stormed to the top of the league winning their first five matches of the season. They would only drop three games all season and this meant they narrowly held on to pip Limpsfield Chart to the title and promotion to Division Two, where they will now face Leigh and Eynsford next term. Two teams at the top of their game gave us the very best of the competition this season as they went head-to-head in Division Four of the Kent County Village League. Kemsing and Chiddingstone traded blows at the top of the table all season long and after a narrow victory at home, it looked like the league would be awarded to Chiddingstone. However, Kemsing were not ones to give up easily and went on a winning streak, overtaking their rivals on the penultimate weekend of the season. Otford and Halstead gave a good account of themselves finishing 3rd an 4th respectively but were ultimately no match for Kemsing or Chiddingstone who will now progress into Division Three where they will meet Stonewall Park. The Amblers turned their season around after a mixed start saw four straight losses followed by a streak of seven matches unbeaten to raise them into a promotion spot in Division Six. 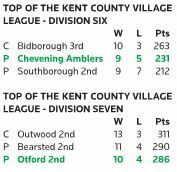 Otford 2nd meanwhile were also on the move in Division Seven as they sneaked a promotion place out of the bottom division after losing just four matches all season. Eynsford 2nd were unlucky finishing just below them in fifth place.